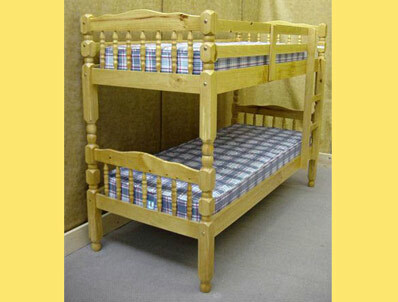 Friendship mill Turned pine bunk bed is new and offers a Good quality british made pine bunk bed that uses stronger scandinavian pine timber instead of brazilian pine from suppliers from the far east. The bunk bed is available in either small single which will take 75cm x 190cm long mattresses or standard single which will take 90cm x 190cm mattresses ( mattresses not Included and no 75cm size mattresses available as a option ) . The price is for frame only , the mattresses pictured are for illustration only, if you require mattresses we would recomend the relaxsan moon mattress which is 15cm deep and available in soft or firm at £99 each or a Sleepshaper memory pocket 1000 mattress which is 20cm deep and costs £159 . Delivery to of the bunk bed is up to 10 working days and will be delivered direct from the factory , mattresses will be sent from us via parcelforce if required.